Tuning skis at home is easy. Taking your skis to a shop for a full tune-up is necessary at least once a year, but if you want to keep them in prime condition throughout the winter, you should learn how to tune skis at home. It not only saves you $30 to $50 each time, but will also eliminate several trips to the local ski shop. 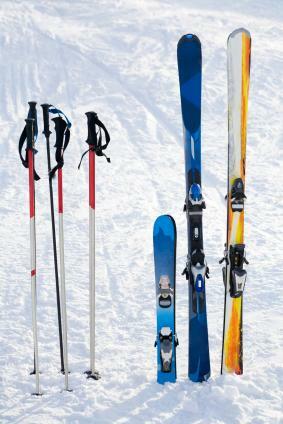 Tuning your skis involves flattening and repairing the bases, sharpening the edges, and applying a hot wax to the base. All of this makes your skis move faster and will help you improve your skiing technique. You will know it is time to tune your skis when you see a significant amount of scratches or large gouges in the bases. Also, when the snow is hard-packed or icy, you will want to make sure your edges are sharp. Most of these items can be found online or at a ski shop. Ask your local tuner what brands are best. You might even ask for a quick lesson on how to tune skis if they aren't busy. Once your skis are secure, clean and flat, it is time to sharpen and repair your edges. This is an important part of the tuning process because a good edge can dramatically affect the way your skis slide and turn on the snow. The final step in tuning your skis is to wax them with the appropriate type according to your manufacturer's recommendations and snow/weather conditions. There are different kinds of wax for slushy snow, powdery snow, and cold, sticky snow.